For National Football Authority, we interviewed Panthers LB Thomas Davis. Read what he says about his rehab from 3rd ACL injury, what he expects his role to be in 2012, and big expectations in and around the team. Click here to read all about it. 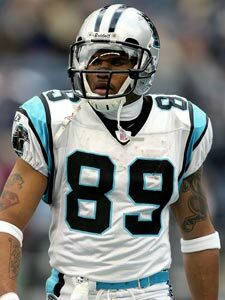 For National Football Authority, we break down the Carolina Panthers’ decision to re-sign Steve Smith. What does it mean for the Panthers’ offense and Cam Newton? What does it mean for their salary-cap situation? And what does it say about Smith? Click here to read all about it. Will the Carolina Panthers draft Dontari Poe? For National Football Authority, we break down the Panthers’ defensive tackle needs and how they may address them in the draft. Will they pick Memphis DT Dontari Poe, who is the most impressive physical specimen? Or will they go for a less flashy option such as Fletcher Cox from Mississippi State or Michael Brockers from LSU? Click here to read our analysis. 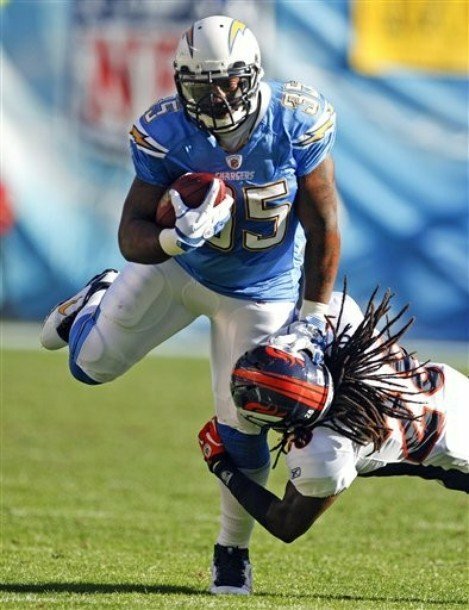 For National Football Authority, we break down the Carolina Panthers’ signing of ex-Chargers RB Mike Tolbert. What does the move mean for RBs DeAngelo Williams, Jonathan Stewart, and Mike Goodson in Carolina? How does it change Cam Newton’s role? Click here to find out. Each year, we use Football Relativity as a tool to compare the class of franchise and transition players. We’ll compare them on a 10-point scale, with 10 being a franchise MVP and 1 being a why-bother-keeping guy. DEFINITIONS: Under the current rules, the franchise tag guarantees them one-year salaries equal to the average of the top five at their position as determined by a new, complicated formula. There are two kinds of tags: an exclusive tag, which guarantees more money on the one-year tender and prohibits a player from negotiating or signing with another team, and a non-exclusive tag, which offers a guaranteed one-year tender but also guarantees a team two first-round picks if the tagged player signs a long-term contract with another team. On to the comparison. All players are non-exclusive franchise players except for the first entry, Drew Brees. 10 – QB Drew Brees, Saints – It’s amazing that the Saints couldn’t get a deal with Brees, who is an elite, championship-quality quarterback at the top of his game. But the team and Brees are so far apart on a long-term contract that they had to use the tag. That’s a good financial deal for the team in 2012 – the $15 million or so they’ll pay for the exclusive franchise tag is below market value for a quarterback of Brees’ caliber. But it keeps the Saints from tagging other free agents like OG Carl Nicks and WR Marques Colston, and it could also make it harder to get Brees signed long-term down the line. Chances are the Brees waits till the last possible moment to sign the tender, since that’s the only way he maintains leverage – by missing offseason workouts. That’s not a good way to go into the offseason and try to bounce back from a painful playoff loss in San Francisco. The Saints may claim to be financially responsible, but it seems like they’re just being cheap. 9 – RB Ray Rice, Ravens – Rice is by far the Ravens’ best offensive player, and they cannot afford to lose him. But at the same time, it’s hard to imagine paying the freight for a long-term deal for a running back who has gotten as many carries as Rice has. But the Ravens need to follow the examples of the Vikings (with Adrian Peterson), the Panthers (with DeAngelo Williams), and the Texans (with Arian Foster) and keep Rice around for the long term. Baltimore has a strong front office, and so we can expect them to make a deal at some point this offseason. Until then, Rice stays put on a $7.7 million tag. 9 (con’t) – RB Matt Forte, Bears – Like Rice, Forte is a do-everything back who is the best offensive player for his team. And while Forte was injured last season, he returned to play in the Pro Bowl to prove he is healthy headed into free agency. Forte may be half a step behind Rice in terms of talent, but he is as productive and as essential. It’ll be interesting to see how the Bears end up paying Forte over the long haul. 8 – WR DeSean Jackson, Eagles – Jackson is one of the most unique players in the league. Few receivers have the pure speed that he has, and so few receivers can take the top off a defense like Jackson. But he’s also a prickly personality who probably needs to be a premium No. 2 receiver but who demands the attention, targets, and money of a No. 1 wideout. For those reasons, the Eagles may look to deal Jackson if the right offer comes along. If not, the Eagles will pay Jackson $9.4 million to keep him around for 2012, and that price, though steep, is still palatable. The resolution of this tag situation will be one of the most interesting sagas of the offseason. 7 – WR Wes Welker, Patriots – The Patriots found Welker as a restricted free agent and turned him into the league leader in receptions. He’s nearly unstoppable coming out of the slot, and at this point he is Tom Brady’s preferred target. Welker’s reliable presence has allowed the Pats to develop tight ends Aaron Hernandez and Rob Gronkowski into down-field targets, and that should take a little pressure off Welker. But until New England finds a true outside threat, Welker is still irreplaceable. That made it a no-brainer decision to put the tag on Welker and make sure he’s around in 2012. 6 – CB Brent Grimes, Falcons – Grimes has developed into the type of cornerback who gets the shutdown label. That’s been vital in Atlanta, who had sought to find that corner first by drafting DeAngelo Hall and then by paying Dunta Robinson. Grimes is now better than both of them, and that means the Falcons can’t afford to lose him. The $10.6 million franchise tag is pretty stiff, but it’s a price the Falcons can’t help but pay. If they want to move from being an annual playoff team to being a true title contender, they need to add players like Grimes, not lose them. 6 (con’t) – DE Calais Campbell, Cardinals – Campbell has developed into a top-flight 3-4 defensive end, and those guys are incredibly hard to find. So the Cardinals are willing to spend $10.6 million to keep Campbell around for 2012. Last year was Campbell’s best, as he had eight sacks, 11 passes deflected, and even blocked three field goals. He is now a core player for the Cardinals, and so tagging him is definitely worthwhile. Campbell did get the non-exclusive tag, but it’s unlikely he will get away for two first-round picks. 6 (con’t) – WR Dwayne Bowe, Chiefs – After signing CB Stanford Routt, it became obvious that the Chiefs would let CB Brandon Carr enter free agency and instead tag Bowe, who has produced big numbers as the team’s No. 1 receiver. Bowe isn’t always consistent, and he can even disappear at times, but his combination of size and speed is rare. With a new offensive system in place now that Todd Haley is gone, the Chiefs need to give Matt Cassel and company the best chance to succeed, and that means keeping Bowe in town, even if he’s not a perfect receiver a la Larry Fitzgerald. So the $9.4 million tag for Bowe is a necessary move, even if it seems too pricy. 5 – S Michael Griffin, Titans – Instead of tagging CB Cortland Finnegan for $10.6 million, the Titans chose to keep former Pro Bowler Griffin around. The former first-round pick had his best season in 2010, and he has 17 picks in his five seasons. He’s a rangy player who helps corners like Finnegan play more aggressively by providing a safety net. That’s a worthwhile role, and it makes Griffin a solid investment at $6.2 million in 2012. 5 (con’t) – DE Cliff Avril, Lions – Avril is a developing player who had a career-high with 11 sacks in 2011. Obviously, he is benefitting from playing with a talented defensive line, but he has emerged as the best pass-rusher on the end over Kyle Vanden Bosch. Avril can be a core player, but the $8.8 million one-year tag is a little steep given his resume. Still, given the premium for pass rushers on the open market, it’s no surprise that the Lions used the tag to keep him around. 4 – S Dashon Goldson, 49ers – Goldson hit the free-agent market unfettered last year, but in the compressed offseason he didn’t get the kind of attention he wanted. After signing a one-year deal, Goldson now hits the market again, but this time the 49ers tagged him. He’s worth keeping for $6.2 million because he’s a big, rangy safety who hits. By tagging Goldson, the 49ers risk losing CB Carlos Rogers, who had a fine season last year. But Goldson’s tag is cheaper than Rogers’ would have been, and he’s been a key starter in San Francisco longer. 4 (con’t) – OLB Anthony Spencer, Cowboys – Spencer, a former first-round pick, had a break-out season in 2009 but has leveled off a bit the last two seasons. He’s a good outside linebacker who can create pass rush across from DeMarcus Ware, but he’s not a dynamic player. The Cowboys need to ink Spencer to a long-term deal to lessen the $8.8 million tag he’s currently under, but they’re wise to keep him. 3 – S Tyvon Branch, Raiders – Branch is a solid starter for the Raiders, not a game-changing player. But after losing CB Stanford Routt to a salary-cap saving move earlier this offseason, and with FS Michael Huff perhaps headed for the same fate, the Raiders wanted some continuity in the secondary. Branch will now provide that at strong safety for a $6.2 million price tag. By tagging Branch, the Raiders opted to let RB Michael Bush hit the open market. Picking Branch over Bush (a part-time player who would have cost $7.7 million) was probably the right move for a team with serious salary-cap management issues. 3 (con’t) – DE Robert Mathis, Colts – The Colts franchised Mathis then quickly re-signed him just after the deadline. We discussed more about why this isn’t a great idea in this post. Still, Mathis is a quality player and a potent pass rusher, so he’s worth a contract to someone. 2 – TE Fred Davis, Redskins – Davis is a good player, but he’s not a franchise-caliber player. Plus, he served a four-game suspension under the NFL’s substance-abuse policy to end the 2011 season. But the recalculated franchise value means that tight ends are tagged at $5.4 million, and Davis is worth that. In fact, the Redskins might be better off paying him a one-year contract than investing long term in a guy who needs to answer character questions. Davis is a talented receiver, and with Chris Cooley breaking down due to injuries, he will definitely help. But if the tag was at the 2011 level that was $2 million higher, Davis would be hitting the open market. By tagging Davis, the Redskins are letting S LaRon Landry hit the market, which makes sense, because Landry would cost more and is injured too often. 2 (con’t) – PK Phil Dawson, Browns – Dawson will cost more than most kickers – $3.8 million vs. $2.6 – because he was franchised last year as well. He has proven to be a solid kicker in the unfriendly Cleveland weather, and the original Brown (at least Brown 2.0) is a fan favorite. At some point, the Browns will need to lock Dawson in on a long-term deal to keep him, but they’re willing to pay the freight year by year for now. 2 (con’t) – PK Matt Prater, Broncos – Prater has huge power in his leg, which makes him a perfect fit for the high altitude in Denver. He’s good at creating touchbacks and also dependable on long-distance field-goals. That makes him a valuable weapon, especially in the Tim Tebow era where first downs aren’t always easy to come by. The Broncos get to keep that weapon at a reasonable $2.5 million price. 2 (con’t) – PK Josh Scobee, Jaguars – Scobee isn’t well known, but he also has a big-time leg that shows itself on kickoffs and field goals. For a Jaguars team that isn’t always a big spender, paying the lowest franchise tag to keep a solid kicker in town makes sense. Tagging DE Jeremy Mincey would have cost much more but kept an impactful pass rusher, but Scobee is a guy the Jaguars need too. 1 – PK Mike Nugent, Bengals – The recalculated franchise values made it almost a bargain to keep a kicker with a one-year franchise tag at $2.6 million, which is a bit below the market value of a top kicker. That led the Bengals to lock in Nugent, the former Jet who has done a nice job of stabilizing the kicking position since moving to Cincinnati. The Bengals may be better off letting Nugent play under the tag in 2012 and trying to lock in a long-term deal for 2013 and beyond than doing the long-term deal now, since Nugent is coming off a great year but has shown inconsistency in the past. 1 (con’t) – P Steve Weatherford, Giants – Weatherford had a nice season moving across the hall in the Meadowlands from the Giants to the Jets, and his NFC championship game performance against the 49ers was spectacular. He isn’t a Shane Lechler/Andy Lee level of punter, but for a one-year, $2.5 million price tag, he’s a worthwhile investment. It’ll be interesting to see if the Giants seek to lower that cap number by investing in Weatherford for the long term, or whether they wait for him to prove it once again. 1 (con’t) – PK Connor Barth, Buccaneers – Barth has emerged as a solid kicker in his 2 1/2 years in Tampa Bay, and his 26-for-28 field-goal performance in 2011 was terrific. But he’s not a kickoff specialist – Michael Koenen does that for the Bucs – and he’s not an elite long-distance kicker a la Scobee or Prater. Still, given the low franchise-tag number for kickers, you can’t criticize the Bucs for buying a little certainty for $2.5 million.